The Spangen district was built between 1913 and 1922 to a monumental, symmetrical street plan by G.J. de Jongh. There have been moves in various quarters to improve the district's reputation which has been blackened by ghettoization and drug use and trafficking. Traditional housing blocks round Aagje Dekenplein have been tastefully renovated by Lugten Malschaert. 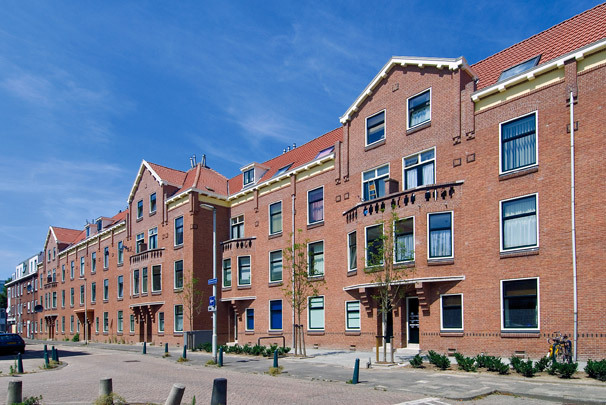 The famous Justus van Effen block of housing by Michiel Brinkman is restored between 2010 and 2012. Furthermore there are projects with self-help housing and DIY dwellings and new housing blocks on the banks of the river Schie by Mecanoo.